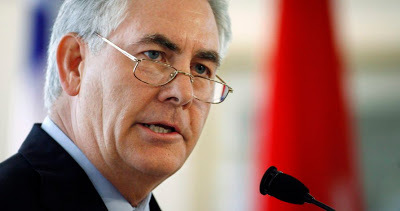 U.S. Secretary of State to visit Nigeria – Royal Times of Nigeria. The U.S. Secretary of State, Mr Rex Tillerson, will arrive in Abuja today for his first official visit to Nigeria. A press advisory from the U.S. embassy said Tillerson would hold talks with President Muhammadu Buhari on Tuesday. The embassy stated,“When he arrives, Tillerson will become the highest ranking official in the Trump Administration to visit Nigeria. “Tillerson is expected to be joined in the press availability by Minister of Foreign Affairs Geoffrey Onyeama,”. Tillerson has been on a week-long tour of Africa.